In honor of all the Fathers out there Amaretto is releasing Happy Father's Day 2016 Editions! These beauties will be available from today June 10th, 2016 until June 24th, 2016!! By breeding any of these you could get a chance at the Overo Azure! 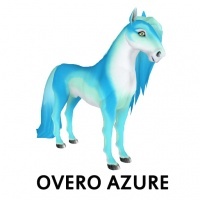 The Overo Azure Coat DOES have the ability to pass! This page was last edited on 29 June 2016, at 20:50.